Photograph of a baby identified on reverse as Evelyn Agnes Hill; sadly, no photographer's imprint, which might have given a clue to locale. I found a reference to an Evelyn Agnes Hill in a program of Bryn Mawr dated 1898/1899; the reference also mentioned Golden Hill Seminary in Bridgeport, Connecticut. I had initially dated this photograph to about 1900, which would make the Evelyn in the photograph born after the Evelyn in the program. But it's possible that the photograph may be older. What do you think? I imagine it's harder to date baby clothing than women's fashions. I found Evelyn A. Hills living all over the United States but thought I would mention a few from New England, as I purchased the photograph in Maine - though the place of purchase may have nothing to do with the locale of the photograph. I found an Evelyn A. Hill, born in 1902, in the 1910 Census of Moretown, Vermont, living with her aunt and uncle, Joseph and Bertha Hill, but she may have been Evelyn Alice Hill. I also found an Evelyn A. Hill born abt 1881 in Massachusetts, in the 1900 Census, living in Woburn with her parents Waldo and Mary Hill. Another Evelyn A. Hill was born in Vermont in abt 1904, and was listed in the 1910 Census of Middlesex, Vermont, living with parents George and May Hill. 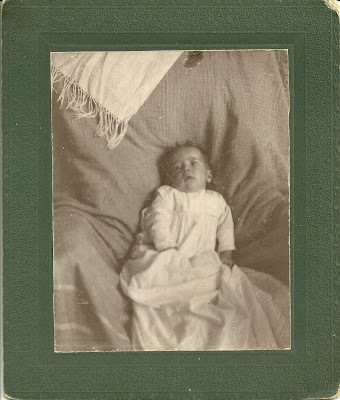 And another Evelyn A. Hill born in Massachusetts about 1907, living in Arlington, Massachusetts with parents Howard and Anna. If you have any insight into the Evelyn Agnes Hill in the photograph, please contact me so that I can properly identify her. Thanks for stopping by!